This lens might well be the best 50 mm macro lens available (well, except for its sibling, the FA 50/2.8 Macro). It is extremely sharp, it offers a very wide aperture (for a macro), it is much smaller and lighter than the various 100/2.8 macros, and it reaches 1:1 magnification without extra attachments. However, as inherent to all 50 mm macro lenses, at high magnifications the lens-to-subject distance is extremely small (only 48 millimeters at 1:1). Therefore extra care should be taken not to throw shadows on the motive and not to scare live subjects. This lens does not always need to be used for macro applications. It performs equally well as a "normal" lens, and can be used for portraits, landscapes, etc. However, because of its size, weight, and relatively slow speed, it does not fully replace a dedicated "normal" lens. The F 50/2.8 Macro is made from quality materials, and feels very sturdy and solid. However, as with most AF lenses, the focusing ring is somewhat loose and turns with very little resistance. And since a macro lens gets focused manually more often, this criticism is quite important. 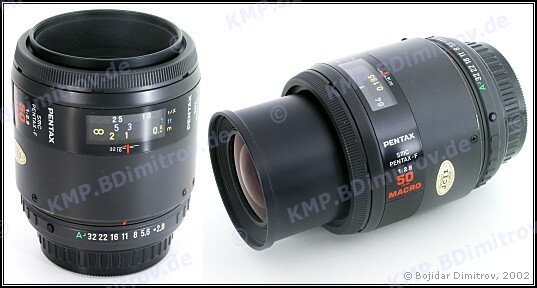 It was even addressed by Pentax, but only in the F-lens’ successor, the FA 50/2.8 Macro. Since this lens shares the same optical formula and probably the same glass coatings as the FA 50/2.8 Macro, it is expected that its optical performance is also absolutely impressive.